I bred her myself and have done everything with her from the moment she was born until now. She is 9 years old. She has always been opinionated and stubborn. During backing she was very nappy. She is quick with a hind leg if you upset her (that doesn’t take much!). My amazing instructor and I had worked out most of her issues but early this year she had to have a few months off due to a SI strain. When I started bringing her back into work she started again with the napping, bucking and spooking. My schooling looked more like we were the ball in a pin ball machine! 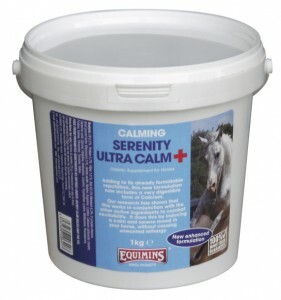 I was at my wit’s end, absolutely desperate, when I saw a T&T to try Serenity Ultra Calm +. Luckily I won! After just one day, when I mounted she was softer. She wasn’t perfect but so much more relaxed. She wasn’t tense in her neck and the contact was loads better. For the next few days we weren’t able to school her as the livery yard were having a new surface put down. I don’t usually give her more than a day or two off at a time so I wasn’t expecting the next ride to be great. She didn’t spook at all and nor did she buck. The canter was still very tense and she was having a good look around but no explosions. Over the last couple of weeks things have gone from strength to strength. I can now safely hack her on my own. (Previously it was not unusual to take 15 minutes just to step off the yard) She has hacked out on her own several times now without a single nap. I have never had her this relaxed hacking on her own in the whole of her life. I even managed to ride my other horse and lead her whilst out hacking. My lessons have now become about technique rather than advice on how to stay on! My trainer is always very positive but previously her compliments were ‘tactfully ridden’. Now she says our hard work and determination are really starting to pay off. We even managed to introduce lateral work in the canter. The supplement has not taken away any of her energy, which is great, and I can now focus the energy into something productive. I think Kali is a lot happier in herself now as well, she is so much less grumpy and actually seems to be enjoying her work now. Things could have turned out so differently for us. Thank goodness for Serenity Ultra Calm +. 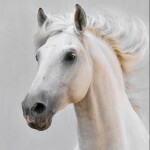 I have now put my other mare on the supplement as well and ordered a giant tub! I wouldn’t hesitate to recommend it to anyone. I started Kali on two scoops a day just to get it into her system as quickly as possible. At first she wasn’t sure of the taste, I added a little more roughage and now she gobbles it up. I am now spreading the one scoop between morning and evening feeds and this does make a difference to just feeding it in the evening feed. To find out more about Serenity Ultra Calm +, the calming supplement with the money back guarantee, visit the website here.